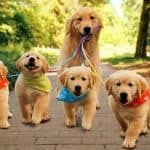 When it comes to Golden Retriever and American Golden Retriever, there is much confusion as well as many debates. Have you ever wanted to know the difference between them? To help you understand more about these two dogs, we’re here to list the main differences between these dog breeds. Keep reading this article so that you can more easily make your decision when choosing between them. Nowadays, one of the most famous breeds of dogs is the golden retriever. These dogs originally come from Scotland. They are known as hunting dogs due to their ability to find as well as bring back all the hunted prey as the hunters do. 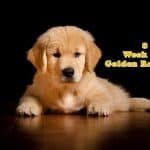 For the best result, we can choose the golden retriever for this task. So, why? it’s because these dogs are obedient. They can be able to learn skills and tricks in no time. Then, this dog breed was mixed with other breeds to create a variety of them. In spite of that, there are two most common ones including the American golden retriever and the English cream golden retriever. Over many years, the Americans found a different style of breeding that is suitable for their hunting styles. American Golden Retriever is known as a longer and taller dog. This dog breed comes with a high hunting drive as well as a golden to deep red coat. But, the American Golden Retrievers are considered Golden Retrievers just like English Golden Retrievers. This dog breed is common in Europe and other countries. It’s simply referred to as Golden Retrievers. But, this dog breed is called English Golden Retrievers in the US. This dog and the American Golden Retrievers have many differences in color as well as physical characteristics. These two dogs may have differences in some ways. However, they still are common similar in other ways. Both of them are known for a high level of sociability towards people as well as other pets around. Both English Golden Retrievers and American Golden Retrievers are intelligent and loyal. Indeed, they may be kept as guide dogs. Also, they may be kept as assistance dogs, rescue dogs, or search dogs as well. For both of them, you can play the game of fetch or catch with them because these dogs can be able to bring it back. These two dogs are great choices for families with children. In fact, they can get along with children well. The English golden retrievers come in a white color In the same term, the American golden retrievers are known for a dark brown closer to a red colour coat. The English golden retrievers come with a box like head. The American golden retrievers come with a fox kind of head. When mentioning behavioural issues, the American Golden Retrievers are less calm than the English golden retrievers. The fact is that the American golden retrievers are very good at athletics. These dogs are full of energy. When it comes to the training process, it’s easier to train the English Golden Retrievers compared to their counterpart because these dogs are actually calm. So, they can learn more quickly. When comparing English Golden Retriever to American Golden Retriever, the most difference is the color of their coats. This difference is actually depended on the breeding standards of them. According to the AKC, American Golden Retriever has lustrous golden of various shades in color. According to the standard established by TKC, English Golden Retriever has the shades of cream to the greatest extent of gold. These dogs come with water-resisting undercoat. In fact, the American Golden Retrievers come with a longer and thicker coat when compared to the English Golden Retriever. On the contrary, the English Crème Golden Retrievers are known with shorter and wavier coats of fur. The American Golden Retriever is known for a head structure. It’s broad-skulled and arched. The dog has the arch that stretches laterally and longitudinally. This dog breed has medium to large dark eyes. In addition, they come with closely-fitted rims. They normally come with short ears with the front edge in the right above their eyes. These dogs have medium-long necks. The English Golden Retrievers are determined by a well-balanced head. They come with a broad skull. It doesn’t offer a sense of coarseness. These dogs come with moderately sized ears. There is a reasonable distance between their two eyes. These dogs seem to be a well-built appearance because of their necks. When it comes to health, these two dog breeds commonly suffer from similar diseases. When it comes to cancer, there is a difference between them. According to research and statistics, the Golden Retrievers are more prone to cancer when compared to their counterparts across the pond. Besides cancer, they also may suffer from lymphosarcoma, osteosarcoma, and mast cell tumour. A health study conducted by the Golden Retriever Club of America shown there is about 61.4% of American Golden Retrievers that lose their lives because of these conditions. When mentioning median age, the American Goldens can be able to live for up to 10 years and 8 months. The English Golden Retrievers can be able to live for up to 12 years and 3 months. The fact is that American Golden Retrievers are great choices to keep in your family. However, if you are looking for the slightly more mellow temperament, we recommend you to consider getting the English Golden Retrievers. 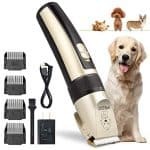 If you are looking for a pet to keep at home, you can consider both English Golden Retrievers and American Golden Retrievers. Both of them are fun and lovable to have at home. Sure, these dogs won’t disappoint their owners. In this post, we have already given you essential info regarding these two dog breeds. They have both differences and similarities. Hopefully, they can help you more easily to choose one that is suitable for you.